Home » Energy » Are Missouri Buildings Energy Efficient or Spendthrift? Are Missouri Buildings Energy Efficient or Spendthrift? Are Missouri’s buildings energy efficient, or are they energy spendthrifts? How do we compare to other states and to the nation as a whole? The U.S. Department of Energy recently launched a new Buildings Performance Database, the “largest free, publicly available database of residential and commercial building energy performance information.” It can’t fully answer the question, but it makes a start. The database consists of energy information voluntarily uploaded by building owners and operators around the country. As I write, data on 66,954 buildings have been uploaded, 21,386 of which are commercial structures, 45,567 of which are residential, and one is heaven knows what. The database is very incomplete. It has residential profiles for only three states: Florida (33,315 buildings), Pennsylvania (10,469 buildings), and Ohio (1,607 buildings). As I write, no other states have residential energy profiles. Only 4 states have data on as many as 4% of their commercial buildings. In addition, contributing data is voluntary, and those who do are self-selected. The data may contain inaccuracies, and the buildings may not be representative of the general building stock. Further, the energy consumption of a building may have as much to do with what goes on inside the building as it does with the building itself. Still, even with these limitations, the database is a large collection of data on a topic where data is hard to come by. 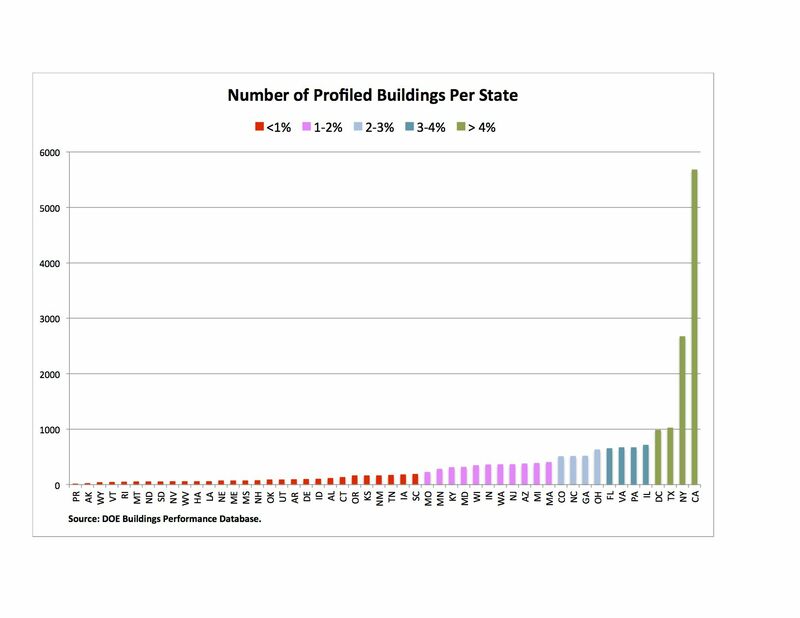 The first graph at right shows the number of profiled commercial buildings per state. Large states with large urban areas have more buildings in general, and they also have the most profiled commercial buildings. Small states and rural states tend to have fewer. One exception is the District of Columbia, which has a large number, perhaps because of the influence of the federal government. The columns are color coded by the fraction of the commercial buildings in the state that have been profiled. For more than half of the states, it is fewer than 1%. In Missouri, 222 commercial buildings have been profiled, between 1% and 2% of the building stock. Nationally, the median annual energy consumption per square foot of building space is 199,000 Btu, and 1/4 of all buildings (5,476) were in the lowest group, centered at 72,000 Btu per sq. ft. Some buildings use tremendous amounts of energy each year. For instance 16 buildings nationwide use about 7 million Btu per square foot of building space, 35 times as much as the median. The second graph at right shows the distribution. The blue circle shows the national median, and the orange circle shows the median for Missouri. In Missouri, the median for commercial buildings is 140,000 Btu per sq. ft. per year, significantly below the national average. Sixty-two buildings (28%) are in the lowest group, centered at 63,000 Btu per sq. ft. per year. The third graph at left shows the distribution. In this graph, the blue circle shows the median for buildings in Missouri. Comparisons between states is not the real purpose of the database, of course. The purpose is to provide information to buildings owners and operators. The database can slice and dice the information according to a variety of building, climate, and location characteristics, as well as according to a variety of building systems characteristics (e.g. what kind of lighting the building has, what kind of heating system). DOE Buildings Performance Database, https://bpd.lbl.gov. By mogreenstats in Energy on 2013/07/18 .